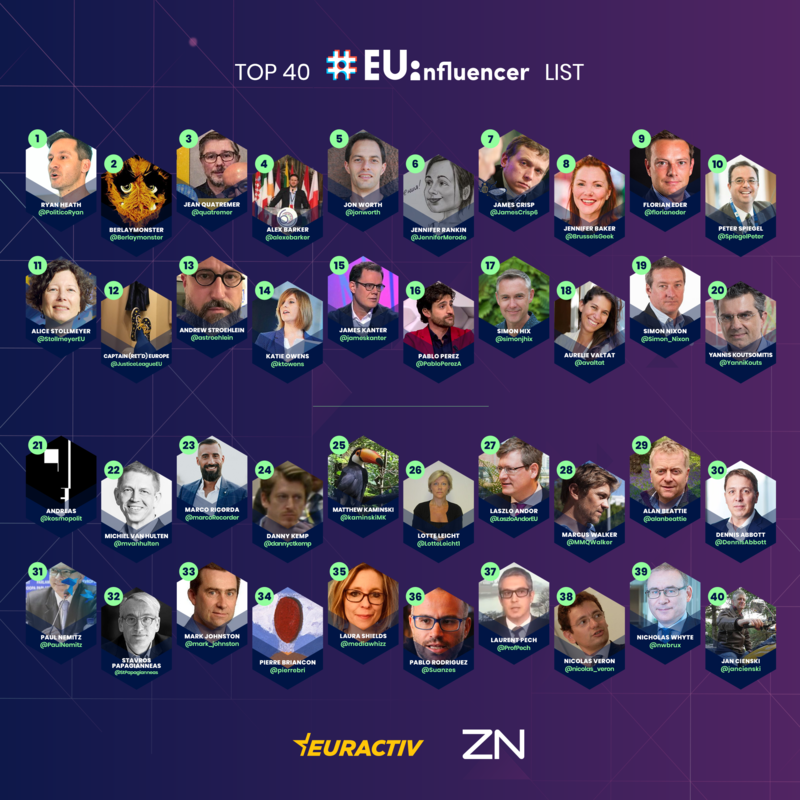 For the second time running EURACTIV.com and ZN have put together a list of digital influencers in the EU bubble. The methodology excluded accounts belonging to EURACTIV or ZN Consulting staff. Heath, the political editor at POLITICOEurope, is in charge of shaping POLITICO’s 2019 European elections coverage. He is also the voice of the EU Confidential podcast and has the go-to Twitter account for EU politics in Brussels. Berlaymonster has conquered the hearts of the EU bubble TwitterSphere. This parody account keeps a satirical eye on European news and counts more than 17,300 followers. Barker has been the Brussels bureau chief at Financial Times since May 2016. He has spent the last five years in Brussels working as the publication’s European diplomatic editor and EU correspondent. Prior to that, he was a political correspondent in Westminster. Jon Worth is a political blogger and a visiting professor at College of Europe, where he has been teaching since 2015. He is a member of the Europe Policy Group of the World Economic Forum and a member of the Anticorruption EU Advisory Group. Jennifer Rankin is a Brussels correspondent at Guardian. She previously collaborated with Irish Times and POLITICO Europe. As Rankin puts it, EU politics not all about Brexit. James Crisp is a Brussels correspondent at Telegraph. Now a freelance journalist and moderator, he worked previously as political editor at EURACTIV, writing the straight-talking newsletter, The Brief. Jennifer Baker is an independent moderator and journalist reporting all manner of EU geekery in particular tech policy. One of her core skills is translating EU policy-speak into understandable English. She presents EURACTIV’s #EUTweets of the Week series, out every Friday morning. Florian Eder is the author of POLITICO Europe’s Brussels Playbook. Prior to joining POLITICO as a managing editor in 2015, Eder was EU correspondent for Die Welt, covering EU politics from Brussels where he arrived at the peak of the euro crisis in 2011. Peter Spiegel is the news editor of @FinancialTimes in London. He previously worked as the FT’s Brussels bureau chief and as a national security correspondent for LA Times and Wall Street Journal in Washington DC. Keep an eye on him: he’s been able to move 23 places up on the #EUInfluencer list. Alice Stollmeyer, Executive Director of Defend Democracy, is a digital advocacy strategist. She has lived and worked in Paris, Amsterdam and Brussels. In 2017 Stollmeyer became interim Communications Director Women Political Leaders Global Forum. She has moved 7 positions up on the #EUInfluencer list. Retired real-life European superhero. This parody account reaches more than 8,500 followers per day with eclectic tweets on public policy, travel, the environment and life in general. Captain Ret’d Europe is a full-time desk jockey in the Brussels machine. Andrew Stroehlein is an American/Belgian/British journalist based in Brussels. A human-rights activist, he currently serves as European Media Director @hrw. He previously spent 9 years as Director of Communications at Crisis Group. He has moved 7 positions up on the #EUInfluencer list. Owens was the influencer at the European Committee of the Regions. She has since joint DG Sante at the European Commission where she continues being the on- and offline connector bringing people together. James Kanter is a freelance journalist based in Brussels, working as EU correspondent for New York times. He covers the struggles over EU integration and writes also on business, politics, health and the environment, filing stories from the Baltic States to the eastern Mediterranean. Pérez has shaped the Brussels bubble for 6 years before returning to Spain, where he still keeps shaking the bubble. Keep an eye on this rising star as Pérez has moved up 14 places on the #EUInfluencer list. We are looking forward to see Perez return to Brussels in 2019. Simon Hix is Professor of Political Sciences and Academic Director of the LSE School of Public Policy. Fellow of the British Academy and of the Royal Society of Arts, Hix is chair of VoteWatch Europe and author of several academic books on EU politics. Aurelie Valtat is head of the digital internal communications at EuropeAid. Into EU global development, she is an experienced political and corporate communications strategist, both in non-profit and intergovernmental organisations. Valtat is a frequent speaker at TEDx. She has moved 5 positions up on the #EUInfluencer list. Simon Nixon is Chief Leader Writer at TheTimes. He previously worked for nine years as Chief European Commentator at the Wall Street Journal, also for five years as Executive Editor at Reuters. He is a graduate of Trinity College at Cambridge University, where he gained a first class degree in History. Yannis Koutsomitis is a television producer and Eurozone affairs analyst. He is a four-time Greek TV Awards recipient for primetime drama production. He is also an analyst on Eurozone affairs and a BBC world service and n-tv.de Politik contributor. Müllerleile is not just a freelance writer and communication consultant, but also the founder of policylab.eu. Müllerleile is one of Twitter’s “early adopters”, and although currently based in Berlin, he is still influencing the EU bubble. Van Hulten has more than 25 years of experience in communication. He tweets about public policy, political risks and campaigns. Lately, he has been at the forefront of #Brexit related tweets. Ricorda is a multimedia multitasker. Ricorda is Head of the ALDE social media team at day, and a podcaster and sports enthusiast at night. Ricorda has moved up two ranks compared to last year’s ranking. Kemp has been one of the best-known journalists in the bubble. He has now left Brussels to head the AFP bureau in The Hague. We are sure he will continue having an impact on politics. Kaminski’s Twitter account is the one with the Toucan. Apart from the big bird, Kaminski’s account is characterised by sharing the latest on international affairs. Leicht’s Tweets focus on Human Rights and humanitarian law. In just 6 years Leicht built a followership of over 40k. Impressive! Many know Andor as EU Commissioner in the Barroso Commission. Andor continued being a major influencer on EU policy, not from the Berlaymont but from auditoriums across Europe. Walker moved up seven places in our ranking. Walker writes for the Wall Street Journal, but also actively engages with his followers. Beatie probably has one of the best EU trade and economy accounts in Brussels. You’d be hard stretched to find an account which is on more lists than Beattie. Rightly so he moved up 9 places in our ranking. Abbott made it for the first time onto our list, congratulations. Apart from political tweets, you’ll find the latest on Middlesbrough FC on his account. Working at DG Justice at the European Commission, Nemitz keeps his audience up-to-date on all things digital. Papagianneas is a Brussels-based communication consultant. Papagianneas hits the spot in 280 signs or 174 pages. Congratulations on the book and moving up eight places in our ranking. Johnston’s mission: saving the world from climate change one tweet at a time. He focuses on climate policy and Brexit. London-based Briançon has one of the “equal opportunity endorsement” accounts. Briançon shares news from different platforms, which makes it one of the most diverse accounts. “If you act like a sociopath I will block you,” says Shields in her Twitter bio. Cannot have been that many, as Shields made it from “way down in the hole” onto this list! Rodríguez is one of those Brussels-based Spaniards keeping his 36k followership up-to-date on the latest on EU policy. If you hablas English and Español – you should follow him. Pech tweets about EU law and rule of law. We wonder if he ever finds time to teach, as his timeline is filled with original comments and replies. Veron is trying to contribute to better economic policymaking, from Bruegel. Travelling between Europe and the USA, he has an impact on both sides of the pond. Whyte is an articulate writer, presenter and public speaker and leading expert on Northern Ireland. Cienski is a senior writer at Politico covering energy, transport and sustainability, and occasionally commenting on Polish politics. what is this? fake news? I never heard of any of these people…. I may not be an all time reader of “Twitter” accounts (as I do not subscribe to the system, so therefore I may be missing out – somewhere – but in the general press circle and EU business areas 25 names are of knowledge to me. What would be better for the EU to report in their EurActiv press and the BlogActiv press portals us who allows the reports through the maze every day as there is a great deal of “mass-agreed nepotism” in these. There is also a large degree of lobbying being parade through these items which is obviously paid for through directly solicited funding mechanisms under “nom de plumes” and fake accounts! Maybe Johan Stavers (YOU) could also add to this. I don’t know what you want me to add but.. yes, really I don’t know any name posted on that list above. But I don’t follow twitter..
#tag ‘every short message’ doesn’t interest me.